In large bowl, beat softened butter and brown sugar with electric mixer on medium speed until light and fluffy, scraping bowl occasionally. Beat in vanilla and eggs until well blended. On low speed, beat in flour and baking soda until well combined, scraping bowl occasionally. Dough will be soft. Divide dough into 4 pieces; flatten each piece, and wrap in plastic wrap. Refrigerate about 3 hours or until dough is firm and cold. Meanwhile, in 2-quart saucepan, mix Filling ingredients. Heat to boiling; boil 1 minute, stirring constantly. Reduce heat to low; simmer about 10 minutes, stirring occasionally, until mixture is darkened in color and thickens slightly. Pour filling mixture into small bowl; refrigerate uncovered until ready to use (mixture will thicken as it cools). Heat oven to 375°F. Remove 1 piece of chilled dough from refrigerator, and unwrap. On work surface generously sprinkled with flour, roll out dough with floured rolling pin to 1/8 inch thick. Using floured 2 1/2-inch round cutter, cut out rounds. In half of the rounds, cut out and remove 1-inch round or desired shape of hole from center. Place whole rounds on ungreased cookie sheet. Spoon 1 generous teaspoonful cooled filling onto center of each round; top with cut out dough round. With fingertips or floured fork, press edges of dough to seal. Return dough centers and leftover dough to refrigerator for rerolling. Bake 7 to 9 minutes or until light golden brown. Cool 1 minute; remove from cookie sheet to cooling rack. Meanwhile, repeat steps on assembling and baking with each portion of refrigerated dough, refrigerated leftover dough and remaining filling. Cool cookies completely, about 1 hour. Store covered in airtight container. For best results and easy prep, use prepackaged chopped dates for the filling. To help get cutout cookies off the surface to the cookie sheet, lightly press back of the cookie spatula in flour and slide under cookie dough for easy lifting. 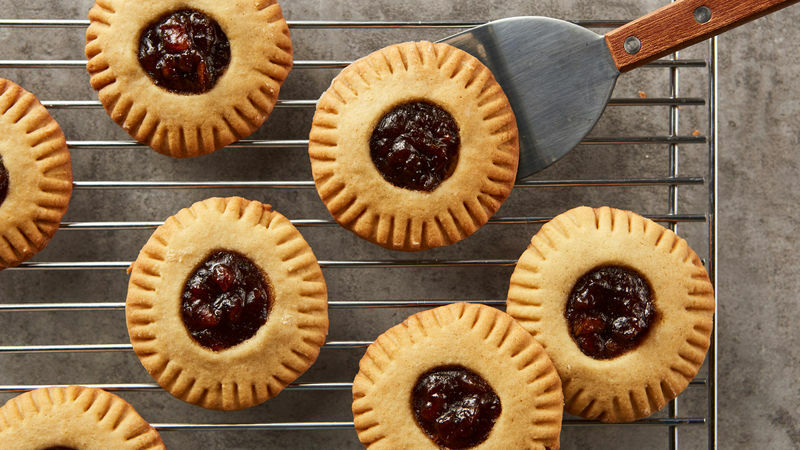 Don’t overlook these date-filled cookies—they are a delicious, traditional treat. There are a bunch of different varieties of dates, but the ones you probably see the most often at your grocery store are Medjool and Deglet Noor. Medjool dates are moist and very sweet, while Deglet Noor are a bit drier, but have a nice nutty flavor. Date cookies are just the beginning. There are so many different types of cookies for you to try! After you’ve tried this recipe, dive into our big collection of Pillsbury™ cookie recipes and get baking! If you have any cookie questions while you work in the kitchen, we have the answers you need.